The world of snowball flavors is divided into sweet and tart, and I prefer tart flavors. To me, the gold standard of icy tartness is Hansen’s proprietary “sno-bliz” flavor, a pale-pink, mouth-puckering syrup with a barely sweet edge. I’d probably eat one a day, except that Hansen’s is 20 miles from my house. 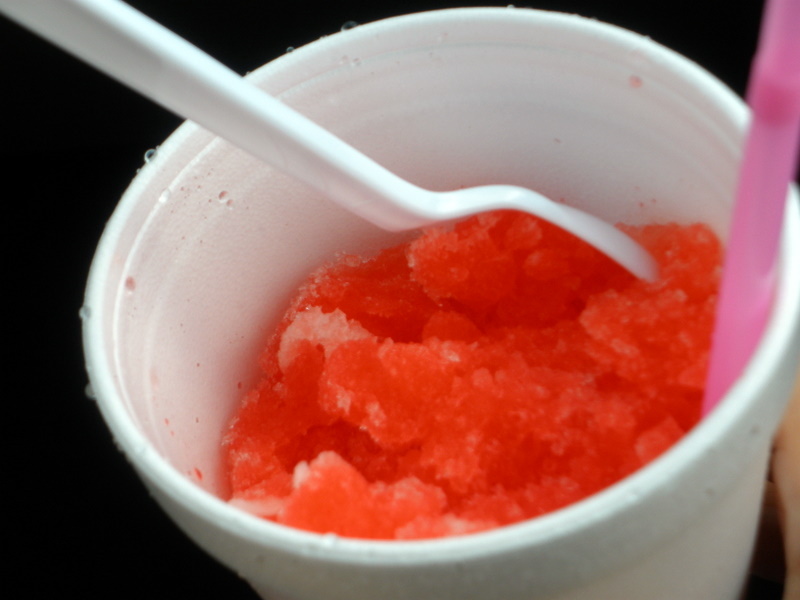 So imagine my surprise to discover a tart, only slightly sweet cherry limeade flavor at Parad-Ice, a bight-yellow snowball trailer on River Road in old Luling….just a few miles from my abode. Thanks, Parad-Ice, for delivering me from sticky-sweet flavors, and thanks for accomodating my special requests (like a larger cup and very little syrup). On the “little syrup” note: it is my firm conviction that almost any ordinary snowball can be improved with restrain in the syrup department….why do so many places drown the ice in a flood-tide of artifical color and flavor? A light hand preserves the ice’s fluffy texture, and light syrup doesn’t overwhelm the taste buds with sugar-shock. Try your next snowball “dry”…let me know what you think. That must be why I never became enthusiastic about snowballs — most of the ones I tried were too sweet for my taste. I didn’t try many because they didn’t seem to hold much attraction for me. I’m with you on the “more tart and less syrup” concept. Years ago, a spot called Sno-Wonder on Magazine street offered a nice selection of “juiceballs”…IIRC, a variety of Knudsen’s 100% juices over ice. The strawberry lemonade was great, as was the pineapple/coconut. I got a snowball today at Plum Street, lemon meringue pie, hoping that it would be this perfectly balanced sweet tart flavor and the whole time I was eating it I kept thinking, this is way too sweet, why do they put all this syrup in it. Great idea. my next snowball wil be dry. I had no idea about sno-bliz at Hansen’s, i’m going to have to go tmw! Have you tried Beaucoup nola on freret? They are supposed to have fresh fruit juice snowballs. I need to get over to Beaucoup NOLA…I also spotted a new place on Magazine near Whole Foods that appears to be some sort of sweet shop…those 5500+ blocks of Magazine are thick with food businesses these days. Rare Cuts is set to open soon at the corner of Magazine & Nashville. I spotted the place on Magazine the other day, too! It was closed, drove by again, closed sign in the window, but they say they have fruit juice snowballs and smoothies, i think. What is Rare Cuts? A real butcher? Yes, Rare Cuts is a specialty meat purveyor.